West Indies coach Phil Simmons has openly expressed his disappointment and outrage at not getting the "best 50-over ODI squad" for the Sri Lanka tour. The West Indies Cricket Board is yet to announce the ODI squad but Simmons blamed "interference from outside" at a selection meeting on September 23, where experienced allrounders Dwayne Bravo and Kieron Pollard were left out. Bravo and Pollard have not been considered for ODI selection since they were dropped for the series in South Africa in January this year. 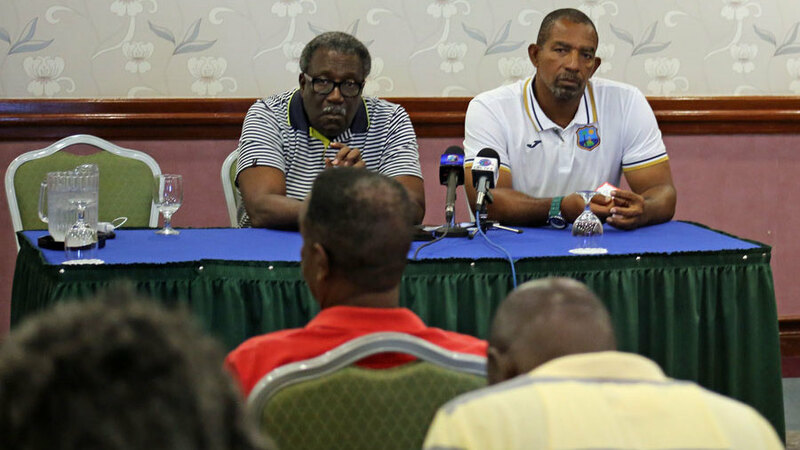 Simmons revealed that Bravo and Pollard had backing not just from him but also Clive Lloyd, the chairman of selectors, and West Indies Test and ODI captain, Jason Holder. However, Simmons and Lloyd were outvoted 3-2 in the selection meeting. Besides Lloyd, the other selectors on the panel are: Courtney Walsh, Courtney Browne and Eldine Baptiste. "I think it's disappointing from the fact that I haven't got the best 50-over ODI squad that we can select in the Caribbean," Simmons said at a media conference, at the conclusion of the West Indies training camp at the 3Ws Oval in Bridgetown. "The chairman, Mr Lloyd, he came and he gave an exceptional speech saying that he thinks it is time they are back in the squad and he gave exceptional reasons for them being back in the squad. Unfortunately, when we went into the selection [meeting] we lost it 3-2. Him and myself - the captain [Holder] doesn't have a vote in this - but the captain also gave his views as to why they need to be back." What annoyed Simmons the most was elements outside the selection panel, although he would not identify who forced the final vote. "That's not the disappointing fact. The disappointing fact is that you can lose 3-2 in a vote-off but there is too much interference from outside in the selection of the ODI squad and it's disappointing for me to know that in any aspect of life … [people would use] their position to get people into a squad; or in this case, get people left out of a squad. It is wrong and I don't like it and that is my beef with the selection of the ODI team." Simmons was blunt about the interference and called it unprofessional: "I don't think that it [selection] was done as professionally as it should be done, [there was] too much interference from outside and in this case, I even go as far as saying maybe influence because of the reasons that were given for them being out. "It's disappointing for me … because we want to have our best squad. The chairman put it to us that we need to have our best squad and it's not so, so I'm disappointed about that squad." Simmons, a former West Indies opener, took over as West Indies coach immediately after the World Cup in March. Simmons was a popular coach in Ireland previously and had earned recognition for his work ethic and the ability to instil a positive attitude in the players. His signature was immediately evident in the home series against England and Australia, where West Indies put up spirited performances - drawing the Test series 1-1 against England and losing 2-0 against Australia. In the past few months, Simmons has sought an audience with senior players like Bravo, Pollard, Sunil Narine to gauge their desire to play for West Indies. According to Simmons, Bravo and Pollard were happy to work with him and told him they were available to play in the limited-overs format. Pollard has never played Test cricket, and Bravo retired from Tests earlier this year. "There was no agreement reached [with the players]. I can't go and say, 'Oi, you're selected'. I had a chat with every one of them saying 'This is the way I think things should be done, are you happy with the way I'm going to do things.' And everyone to a [man] was happy with the way things were going to run, happy with the captain, happy with everything that was to move forward," Simmons said. "So once they had bought into our philosophy as to the captain and myself then it's about selection. I can't go and tell them, 'Hey, you're in the squad' so I think that's all I could have done." Tony Cozier What next for West Indies in the coach saga?